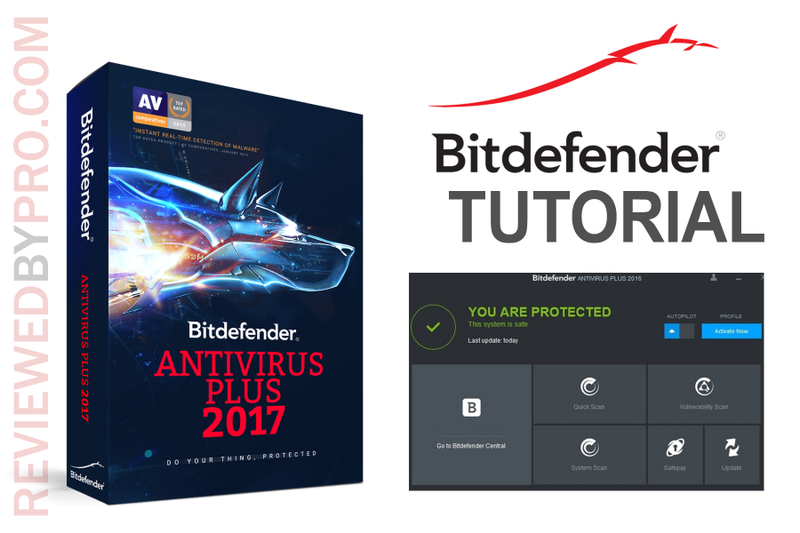 This is a short manual for the Bitdefender Antivirus 2017 software. Just follow these guidelines step-by-step, and you will be able to use this software without any problems. 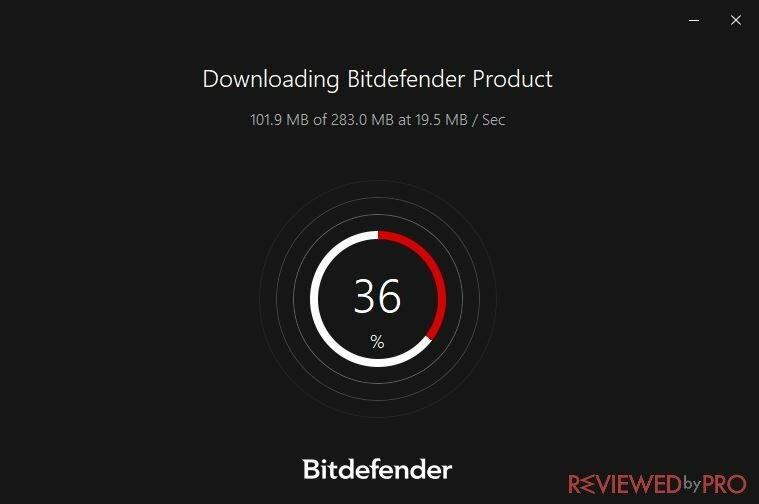 Downloading Bitdefender antimalware software is extremely easy because you can even do it on this page. When downloading, you might need to enter your email address, as the free version will be associated with your email and valid for 30 days. The file is really lightweight and you should have it on your computer in no time. Once you have the installation file ready, you will be able to proceed with installing the software. Click on the file and confirm the opening of it by pressing ‘yes, I trust this source’. After this is done, you will be welcomed to the installation wizard of Bitdefender Antivirus 2017. This is the first window that you will see. You might need to wait a few minutes until all the program's files are downloaded. 1. Here you need to simply click “Install”. 2. Now you might need to wait up to a few minutes until the installation is complete. 3. 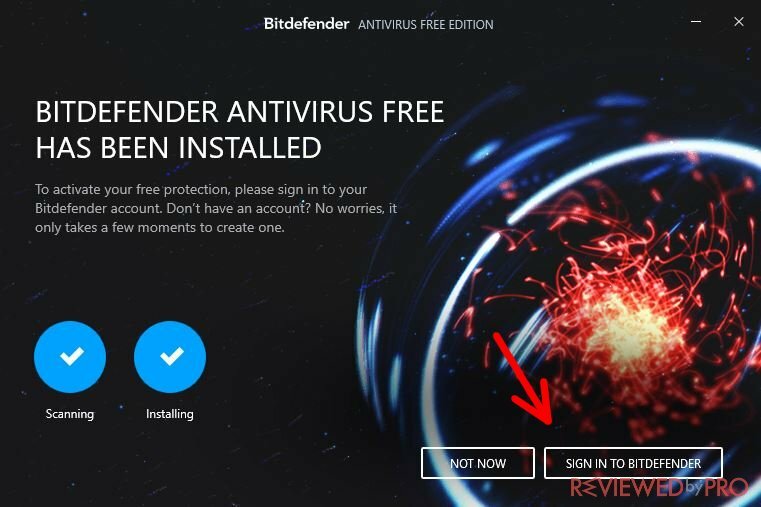 As Bitdefender has been installed, please click on “Sign in to Bitdefender”. 4. You can see the window for creating an account. Here you need to write your first name, last name, email address, and to create a password. When you are done, just click on “Create Account”. Now you can open the anti-virus application and try using it for the first time. Now let’s open the program for the first time and see what all those buttons do. As you can see, there are several different options which we will explore. The free version has significantly fewer features than the paid one. 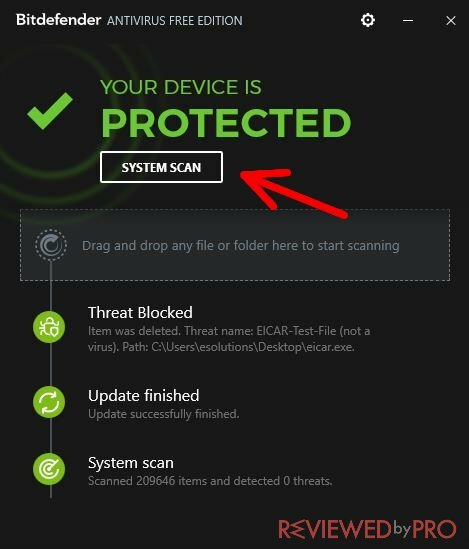 For example, it has a button “System Scan” which allows you to scan the device for viruses, but it doesn't have any options to choose the type of the scan. If you want to perform a scan, simply click the button. Also, there are four tabs: Events, Quarantine, Exclusions, and Protection. They give you the basic information on the scans and threats detected. 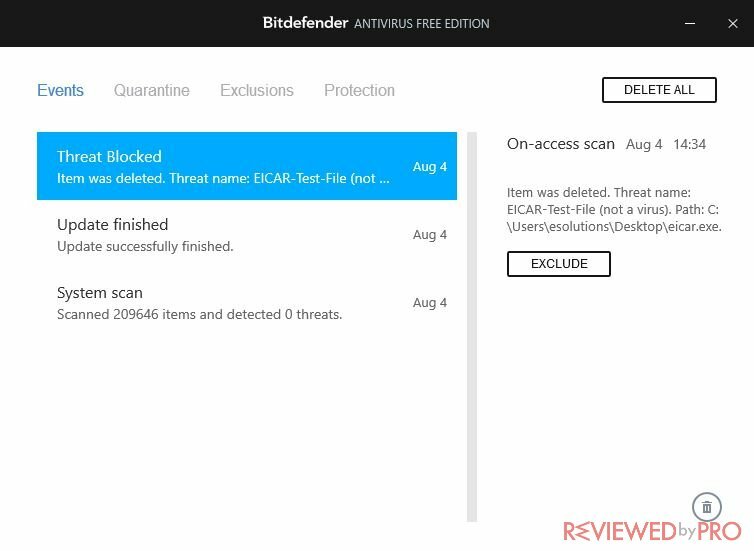 Quick scan – this is one of the most rapid ways to check if your computer is infected by any malware. You will be able to quickly scan your PC. The newest files will be checked and the quick scan should be complete in about ten minutes. If you have any problems with your PC after you do this, you should really use another feature – the full system scan, which will take longer, but it will be more efficient. Vulnerability scan – this feature lets you scan the most vulnerable parts of the system. 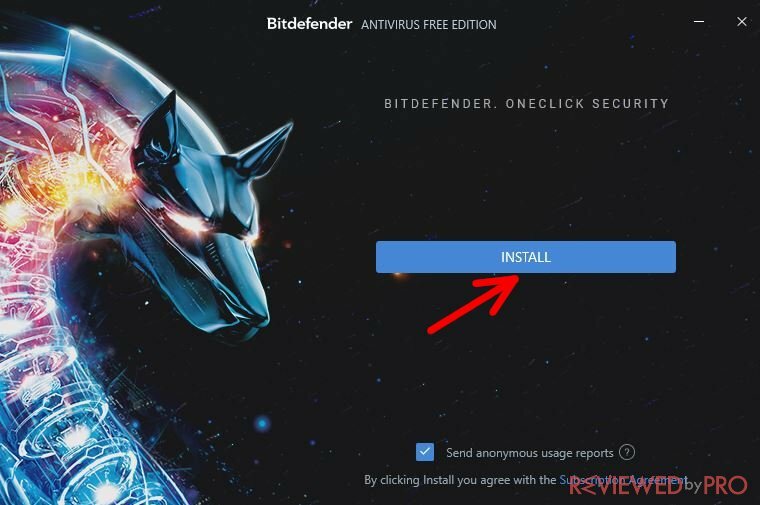 As you turn this feature on, you are able to choose suspicious folders on your system or just let your Bitdefender Antivirus 2017 software do the job for you and auto-detect the most suspicious parts of your operating system. The vulnerability scan takes a lot longer than the quick scan feature, but it is also not as long as the full system scan. System scan – this feature lets you scan the full system with each file on it. Logically, it will take a lot longer than the quick scan or vulnerability scan, but this is the best way to protect your computer from malware that might be hidden deep in your operating system. You will be able to get the results in about 3-5 hours after you start the system scan. Have in mind that IT specialists recommend you do this at least once a week. 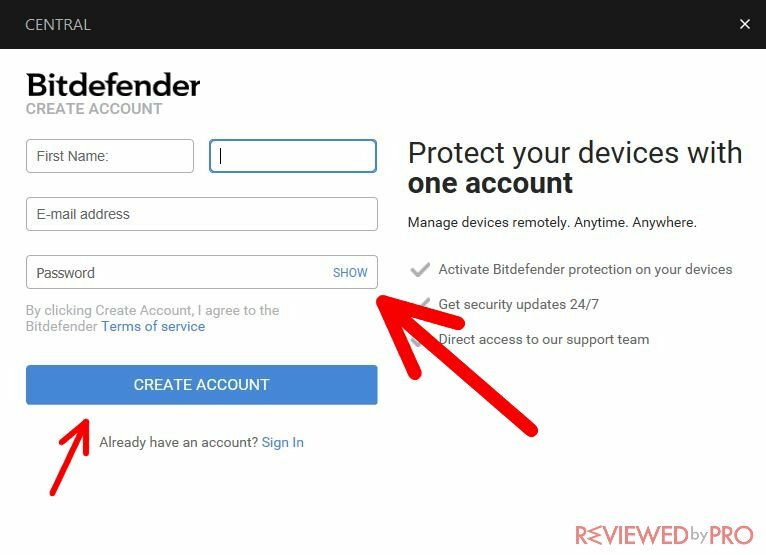 In that way, you will be fully protected and you will gain the best advantage that the new Bitdefender Antivirus app might give you. Update – by using this feature, you will be able to update the virus database, so your Bitdefender program will run efficiently. Do not worry about it if you see a green colour over the update sign – that means you do not have to update anything at the moment and you can continue using your application. As we have previously mentioned, you get to try this software for 30 days. However, after this time passes, you have to decide whether to buy this program or to try a different one. Buying a new license key will cost you $24.99. It is surely one of the cheapest programs in the anti-malware market. 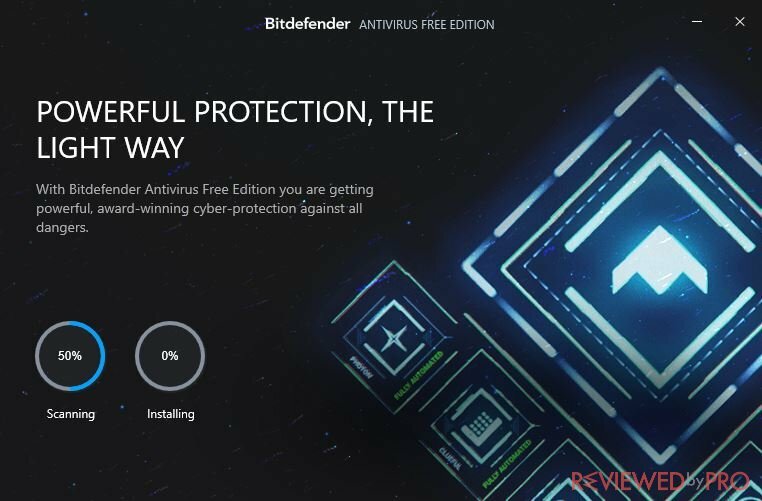 We hope this step by step manual helped you install Bitdefender Antivirus without any problems.